DIE Sabbati, 6 die Septembris. Lewis, D. of Hamilton's Servant, a Pass. Mr. Porter, to be Vicar of Charles Church, Plymouth. and with others for Concurrence. restoring Hancock to the Ensigncy of St. Nicholas, &c.
and about the French Ships taken. Ordinance for Dr. Metcalfe and Dr. Pratt, to be Senior Fellows of Trinity College, Cambridge. Ordinance for not allowing the Fifth Part to Delinquents Wives, &c. coming from the King's Quarters. Message to the H. C. with it; and Drs. 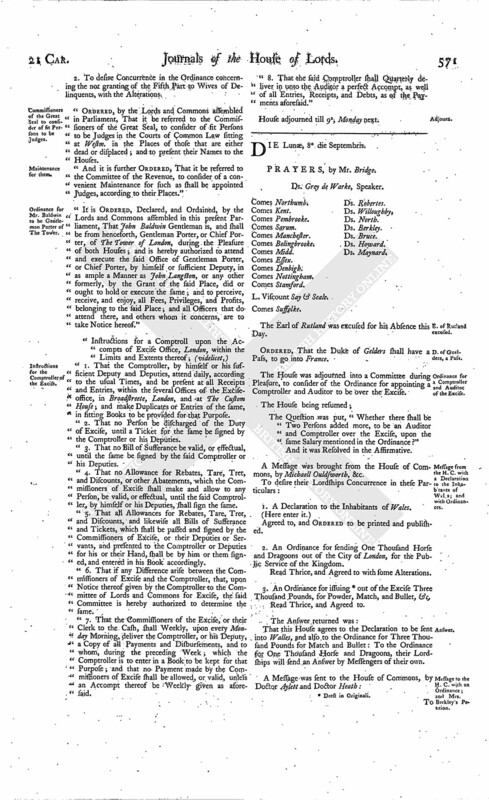 Metcalfe's and Pratt's Ordinance. Commissioners of the Great Seal to consider of fit Persons to be Judges. Ordinance for Mr. Baldwin to be Gentleman Porter of The Tower. Instructions for the Comptroller of the Excise. Ordered, That Monsieur Beliure shall pass his Six Horses, formerly granted him to transport, Custom-free. Ordered, That Lewis Lewis, Servant to Duke Hamilton, shall have a Pass, to go into Holland. Upon reading the Petition of Francis Porter, Clerk: It is Ordered, That the Petitioner shall quietly exercise the Place of Vicar, in Charles Church, in Plymouth, according to the Directory, and receive all Tithes and Rights of the said Vicarage, until Cause shall be shewed to the contrary to this House. A Message was brought from the House of Commons, by Mr. Nicolls, &c.
1. To expedite the Ordinance concerning selling of Delinquents Estates. 2. To expedite the Ordinance concerning the Committee for the Eastern Association. 4. An Ordinance to appoint Tho. Fauconbridge to be Comptroller of the Excise. Committed to a Committee of the whole House, to be considered of on Tuesday Morning next. 6. An Ordinance, That the Town and County of Derby shall have the Moiety of the Excise of their own Town and County, for Six Months, for the Maintenance of the Forces of that Town and County. That this House agrees to the Ordinance for appointing a Comptroller for the Excise; and the Ordinances concerning the chusing of Judges, and the Town and County of Derby, they do agree to: To the rest of the Particulars, their Lordships will send an Answer by Messengers of their own. 1. To put them in Mind of the Dispatch of the Letter to be sent to Sir Tho. Fairefax, concerning Colonel Massie's Forces. 2. To put them in Mind of Preparation of Propositions to be sent to the King for Peace. 3. That this House, above Two Months since, hath sent to the House of Commons certain Votes, concerning John Hancocke, who saved the Island of St. Nicholas by Plymouth; and it being a Matter of so much Justice, much concerning the Honour of the Parliament, and so much in the Eye of the World, they having often heretofore put them in Mind thereof, do now desire their speedy Concurrence in the said Vote. 4. To desire their Concurrence in the Business for receiving the Mariners into Pardon, that have served the Enemy in Flanders. 5. To desire that the Business of the Ships called The Mary of St. Giles, and Nicholas of Diepe, and The Becasse of St. Malo, may be referred to the Committee for Foreign Affairs. To desire Concurrence in an Ordinance for making John Baldwin Gentleman Porter of The Tower of London. 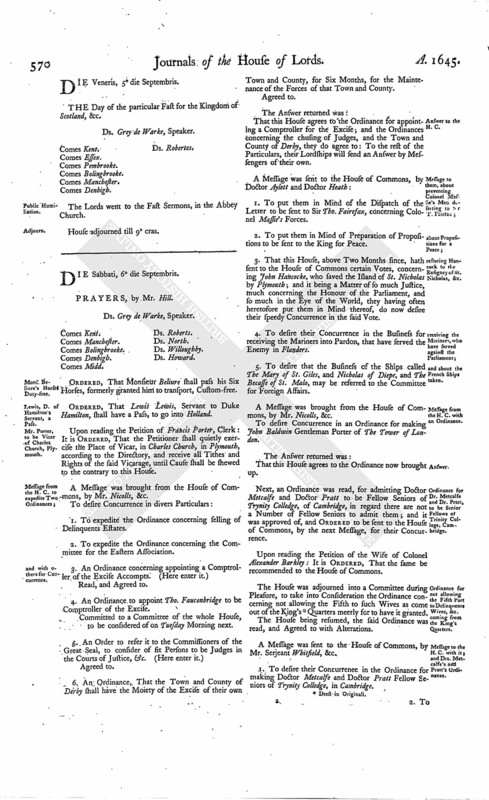 Next, an Ordinance was read, for admitting Doctor Metcalfe and Doctor Pratt to be Fellow Seniors of Trynity Colledge, of Cambridge, in regard there are not a Number of Fellow Seniors to admit them; and it was approved of, and Ordered to be sent to the House of Commons, by the next Message, for their Concurrence. Upon reading the Petition of the Wife of Colonel Alexander Barkley: It is Ordered, That the same be recommended to the House of Commons. The House was adjourned into a Committee during Pleasure, to take into Consideration the Ordinance concerning not allowing the Fifth to such Wives as come out of the King's (fn. 1) Quarters meerly for to have it granted. The House being resumed, the said Ordinance was read, and Agreed to with Alterations. A Message was sent to the House of Commons, by Mr. Serjeant Whitfield, &c.
1. To desire their Concurrence in the Ordinance for making Doctor Metcalfe and Doctor Pratt Fellow Seniors of Trynity Colledge, in Cambridge. 2. To desire Concurrence in the Ordinance concerning the not granting of the Fifth Part to Wives of Delinquents, with the Alterations. "Ordered, by the Lords and Commons assembled in Parliament, That it be referred to the Commissioners of the Great Seal, to consider of fit Persons to be Judges in the Courts of Common Law sitting at Westm. in the Places of those that are either dead or displaced; and to present their Names to the Houses. "And it is further Ordered, That it be referred to the Committee of the Revenue, to consider of a convenient Maintenance for such as shall be appointed Judges, according to their Places." "It is Ordered, Declared, and Ordained, by the Lords and Commons assembled in this present Parliament, That John Baldwin Gentleman is, and shall be from henceforth, Gentleman Porter, or Chief Porter, of The Tower of London, during the Pleasure of both Houses; and is hereby authorized to attend and execute the said Office of Gentleman Porter, or Chief Porter, by himself or sufficient Deputy, in as ample a Manner as John Langston, or any other formerly, by the Grant of the said Place, did or ought to hold or execute the same; and to perceive, receive, and enjoy, all Fees, Privileges, and Profits, belonging to the said Place; and all Officers that do attend there, and others whom it concerns, are to take Notice hereof." 1. That the Comptroller, by himself or his sufficient Deputy and Deputies, attend daily, according to the usual Times, and be present at all Receipts and Entries, within the several Offices of the Exciseoffice, in Broadstreete, London, and at The Custom House; and make Duplicates or Entries of the same, in fitting Books to be provided for that Purpose. "2. That no Person be discharged of the Duty of Excise, until a Ticket for the same be signed by the Comptroller or his Deputies. "3. That no Bill of Sufferance be valid, or effectual, until the same be signed by the said Comptroller or his Deputies. "4. That no Allowance for Rebates, Tare, Tret, and Discounts, or other Abatements, which the Commissioners of Excise shall make and allow to any Person, be valid, or effectual, until the said Comptroller, by himself or his Deputies, shall sign the same. "5. That all Allowances for Rebates, Tare, Tret, and Discounts, and likewise all Bills of Sufferance and Tickets, which shall be passed and signed by the Commissioners of Excise, or their Deputies or Servants, and presented to the Comptroller or Deputies for his or their Hand, shall be by him or them signed, and entered in his Book accordingly. "6. That if any Difference arise between the Commissioners of Excise and the Comptroller, that, upon Notice thereof given by the Comptroller to the Committee of Lords and Commons for Excise, the said Committee is hereby authorized to determine the same. "7. That the Commissioners of the Excise, or their Clerk to the Cash, shall Weekly, upon every Monday Morning, deliver the Comptroller, or his Deputy, a Copy of all Payments and Disbursements, and to whom, during the preceding Week; which the Comptroller is to enter in a Book to be kept for that Purpose; and that no Payment made by the Commissioners of Excise shall be allowed, or valid, unless an Accompt thereof be Weekly given as aforesaid. "8. That the said Comptroller shall Quarterly deliver in unto the Auditor a perfect Accompt, as well of all Entries, Receipts, and Debts, as of the Payments aforesaid." House adjourned till 9a, Monday next.